Ireland has gotten a brand new festival – with its origins in a galaxy far, far away. The new ‘May the Fourth Be With You’ festival will run from May 4-6 of this year, and is aimed at celebrating the Wild Atlantic Way. “Hop in your X-Wing Fighter and let’s fly,” its website gushes. The Fáilte Ireland initiative is designed to capitalise on several Star Wars location shoots that have taken place along the 2,500km route, from Malin Head in Co. Donegal to Ceann Sibeal and Skellig Michael in Co. Kerry – and beyond. Kicking off on Friday, May the 4th (when fans across the globe commemorate the Star Wars Universe), the festival will see events for all ages taking place across the Kerry villages of Ballyferriter, Portmagee, Ballinskelligs and Valentia Island. 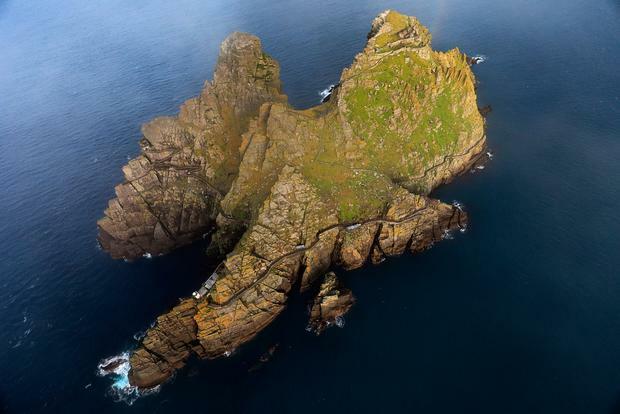 Events will range from drive-in movie screenings to guided film location walks, puffin workshops (the movie’s porgs were inspired by the local birds), a fancy dress céilí and more, all set against the backdrop of the west Kerry coast. “I have been keen to mark May the Fourth in a meaningful way,” said Minister of State for Tourism and Sport, Brendan Griffin, announcing the festival. “I am delighted that events like the outdoor screenings of the film, with the actual film locations visible in the background, will provide amazing imagery for even greater exposure around the world,” he added. Irish locations appeared in both Star Wars: The Force Awakens and Star Wars: The Last Jedi, providing an unrivalled tourism marketing opportunity. This winter, Tourism Ireland ran a €500,000 Star Wars campaign that included launching a billboard into space attached to a weather balloon. “We have worked with local tourism businesses to create a festival that not only gives fans the opportunity to visit the filming locations and take part in some fantastic themed activities but also to learn about the history and natural landscape of the area,” added Paul Kelly, Fáilte Ireland’s CEO. The monastic beehive huts of Skellig Michael have been made into Lego toys ahead of the release of ‘Star Wars: The Last Jedi’. Skellig Michael, or ‘Ahch-To Island’ as it was renamed in the film, has a pivotal role in the movie – it is Luke Skywalker’s hermitage, the location of the first sacred Jedi Temple, and home to the adorable Porgs. The Porgs are bird-like creatures that were inspired by the puffins nesting on the jagged rock face of the Skelligs. They will be introduced in ‘The Last Jedi’. Lego’s ‘Ahch-To Island Training’ set features a miniature corbelled hut and three figures: Luke Skywalker, Rey and a Porg. The set is expected to retail at €25 and includes smaller trinkets, such as a fish, a frying pan, and a lightsabre. The first Lego ‘Star Wars’ set was released in 1999 and coincided with the release of ‘Episode 1: The Phantom Menace’. Skellig Michael features prominently in the trailer for the next instalment in the ‘Star Wars’ film franchise which is due for release on December 15. The Unesco World Heritage Site first appeared in ‘Star Wars’ two years ago in the final scenes of ‘The Force Awakens’. Since then, visitor numbers to Skellig Michael have surged. Visitor numbers are up approximately 2,000 to 16,700 this year compared to 2016. This has encouraged chief executive of Tourism Ireland Niall Gibbons to focus on the development of “screen tourism” in Ireland. Tourism Ireland is looking to countries such as New Zealand which have built entire tourist packages around franchises like ‘The Lord of the Rings’ and ‘The Hobbit’. “‘Game of Thrones’ and ‘Star Wars’ have brought Irish screen tourism into new galaxies. It has brought Ireland to a huge audiences around the world,” he said. Similar to the ‘Door of Thrones’ campaign in connection with ‘Game of Thrones’, Tourism Ireland plans on rolling out a new campaign linking the Wild Atlantic Way to the latest film’s release next month. “The film was filmed along the Wild Atlantic Way so we will be dialling that up in December,” said Mr Gibbons. Plans to extend the tourism season may be restricted, however, due to Skellig Michael’s status as a Unesco World Heritage Site. It is open to visitors from mid-May to the end of September. Several new details have been released about Star Wars: The Last Jedi, Disney’s upcoming sequel to the hugely successful The Force Awakens. Vanity Fair has profiled the film and makes some big revelations about what fans can expect, including some stunning images of cast on location at Skellig Michael off Kerry taken by legendary photographer Annie Liebowitz. Directed by Rian Johnson, the flick, which releases December 15, boasts some new characters including Kelly Marie Tran’s Rose Tico, the maintenance worker for the Resistance who joins up with Finn (John Boyega). She has a sister Paige (Veronia Ngo) who is coached by Poe Dameron (Oscar Isaac) and Benecio Del Toro is also introduced although he’s simply called DJ for now. Laura Dern is also present as Vice Admiral Holdo. Mark Hamill, who plays Luke Skywalker, speaks about filming on Skellig Michael. “When I read the script for Episode VIII, I went, ‘Oh my God, we’re going back?’ Because I said I was never going back,” he told Vanity Fair. At 65 he was given extra time to climb the hundreds of steps. The crew had 45 mins while he was given an hour and a half so he could stop every ten or 15 minutes to rest. Among other details revealed in the piece is the fact that Rose and Finn travel to a casino city called Canto Bight, a “Monte Carlo-type environment, a little James Bond-is, a little To Catch a Thief… I was thinking, OK, let’s go ultra-glamour. Let’s create a playground, basically, for rich assholes.” according to Johson. First, it hosted Luke Skywalker and Star Wars. 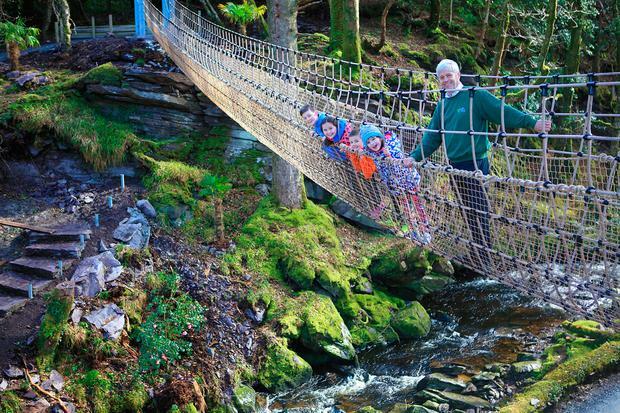 Now, Kerry’s Skellig Coast has opened its own ‘Skywalk’ rope bridge. The 112-foot (34m) structure, straddling the River Delligeenagh at Kells Bay House & Gardens, is claimed to be Ireland’s longest rope bridge. Northern Ireland’s Carrick-a-Rede bridge, by contrast, stretches 20m (66 feet). Kerry’s Skellig Ring has been named one of the world’s top regions to visit next year by Lonely Planet. The accolade comes in Lonely Planet’s Best in Travel 2017, the bestselling collection of travel trends, destinations and experiences for the year ahead. The Skellig Ring connects Valentia Island with Waterville via the Gaeltacht area around Ballinskelligs – and of course, includes the Skelligs themselves. The UNESCO World Heritage Site featured in Star Wars: the Force Awakens, and is set to play an even bigger role in Episode VIII, due out next year. In Portmagee, Lonely Planet recommends stopping into The Moorings, where Star Wars actor Mark Hamill famously pulled a pint. Tourism Ireland will be promoting the Skellig Ring region with a new video and a specially-created page on Ireland.com among other activities, Gibbons added. “I am delighted that The Skellig Ring is being internationally recognised as a place of rugged and ethereal beauty,” added Minister for Tourism, Shane Ross. Lonely Planet’s Best in Travel picks are compiled by writers, editors and its substantial online community of bloggers and tweeters. “The Skellig Ring should be on every traveller’s must-see list,” a spokesperson said. However, not everybody believes the area will see the benefits of additional visitors in the coming year. “The truth is we are already choc-a-block with people already booking for 2017,” said Eoin Walsh, who operates boat trips to Skellig Michael. “We used to be able to go out from April 1 to October 31, but that has been cut by six weeks so the season won’t start until May 22 and finishes on October 2 – so we miss Easter and October mid-term completely. Walsh added: “We’ve had brilliant weather for the past week, but can’t go out because the OPW tour guides aren’t there. Lonely Planet’s Best in Travel 2017 also saw Canada named the No.1 country to visit next year, with Bordeaux topping the list of cities. Star Wars: Episode VII – The Force Awakens had its fair share of excitement, but we’ll be damned if we didn’t get out of our seats to give a standing ovation for the performance of Skellig Michael in there towards the end. The Star Wars crew are back on Big Skelly already under the command of director Rian Johnson and we’ve got video footage of the lads doing their thing, as well as a very ominous ‘opening shot’ looking take of the island. The short film, commissioned from Lucasfilm, features Force Awakens director JJ Abrams and other cast and crew members discussing the Skelligs location. Skellig Michael is “just indescribably beautiful,” says Mark Hamill, who can be seen cracking up with laughter amidst moody poses in the shoot. “It’s sort of a miracle this place,” says JJ Abrams, who has previously said he “could not believe” he was allowed to shoot at the UNESCO World Heritage Site. Tourism Ireland’s Star Wars campaign, with a budget of €110,000, capitalises on the Irish locations seen in Episode VII: The Force Awakens. he fact that the next episode, Star Wars: Episode VIII, is also being shot on location along the Wild Atlantic Way, is another coup for Irish tourism. Up to 35pc of tourists are impacted in their choice of destination by what they see on screen, according to Tourism Ireland – which has also developed extensive campaigns around the filming of Game of Thrones in Northern Ireland. Other elements of the Star Wars campaign have included a special page on Tourism Ireland’s website and a previous, behind-the-scenes film. “Since its release, Star Wars: The Force Awakens has been breaking box office records everywhere and Tourism Ireland has been capitalising on this positive exposure, highlighting the Star Wars connection,” said Niall Gibbons, its CEO. “Ireland has become an important part of Star Wars history,” said Candice Campos, Vice President, Physical Production at Lucasfilm. The Kerry towns that are now in the running for the prestigious title include Killarney, Kenmare, Portmagee, Sneem and Tralee. The selected towns will now be subject to unannounced inspections by ‘secret shoppers’ over the coming weeks and will be judged on development and promotion, local involvement, tourism products available and sense of place. After the secret visits, the list then gets narrowed down to 10, with both the best large and small tourism town being announced in November. The other towns shortlisted are Kilkenny, Lismore, Clonakilty, Belmullet, Ardmore, Adare, Carrick on Shannon, Cobh, Youghal and Mountshannon. Last year’s winners were Westport and Kinsale. Portmagee has been announced as the first ever winner of Fáilte Ireland’s National Tourism Towns Award. It was chosen from a shortlist of ten top tourism towns and has received a grant of €10,000 which will go towards developing the town’s tourism potential. Killarney was also shortlisted and will receive one thousand euro. Following a shortlisting, the top ten towns were visited by a panel of independent assessors, as well as a team of ‘secret shoppers’, who measured the town’s tourism performance and the level of welcome to visitors. The judges found the sense of place in Portmagee to be palpable with its location facing Valencia Island making it unique. They said its rich and colourful history is well recognised and the village’s tradition of fishing is evident at every turn. The judges were struck by the enthusiasm of the local community with a wide array of tourism projects embarked upon by locals. The Portmagee approach is one of hard work and cooperation within all the various sectors in the community and these have resulted in creating a place that is very special to residents and visitors according to them. The judges also noted the importance of the local Skellig Experience Interpretative Centre as well as the attraction of local wildlife, cliff walks, flora and fauna and landscapes which feature strongly in the visitor experience to be had. They said that most of all, the town boasts a great community spirit. Patricia Kennedy was one of the group from Portmagee in Dublin to receive the award. She explained why she thinks they won. President Mary McAleese and husband Martin were our special guests this New Years Eve for the midnight celebration. Ger Sullivan was the New Year and was cheered by a big crowd when he appeared. the best way to start the new year. The year was 1727 when, three days after Christmas, a Kinsale brig, flying a French flag, landed in the Port of Portmagee after coming from Nantes France. The boat’s mission was a cargo that was, let’s say, not in the interest of the British taxpayer, as smuggling on this coast was a familiar feature. The boat remained until the New Year but what was to happen the people of Portmagee on News Year’s Eve 1727 was to going to change their little village for evermore. As the locals were retiring for the night, a strange but eerie noise was coming from the vicinity of the local pier.Many thought it was the banshee (a female spirit whose wailing is said to warn the hearer of an impending death in the family) as the strange sound came up towards the village. To the locals amazement they saw the crew of the french boat holding torches and marching through the village. They were led by a piper and in the centre of the torchmen a shaggy and staggering figure of an old man on his last legs was swaying as if his time was up. They proceeded through the village making a racket and when they returned to the head of the pier a shot rang out and the old man lay on the road as if dead. Silence desceded again but only for a moment when a newly-dressed man with white trourses, swallow-tail coat and top hat emerged from the darkness and he repeated the route of the old man with again the piper leading him and the torches either side. The new man gave a speech to explain to locals about what they had just seen and he went onto inform them that the old man had symbolized the year gone by and, come midnight, he was no more. The New Man smybolised all that was new and the youth of the year that had just begun. And so it was that the custom of the ‘Old Year’ began in Portmagee. Starting the very next year, which co-incidentally was one of the hungriest the village had ever seen, the locals re-enacted the custom in honour of the strange men who had so entertained them the previous year. This tradition has been repeated ever since in the village and, over the years, even with modern technology, very little has changed. The sods of turf (peat) were always steeping in paraffin oil for a week in anvance of the night. The local children would go through the village at about 8 o clock rattling tin cans and making as much noise as possible to get locals out with money as there would be a collection for the paraffin oil. Everything has stayed the same with the carrying on of tradition being the primary motivator in organizing this every year. The Millenium old year was the biggest of all with many magazines nominating Portmagee the place to be on this wonderful night. So, for generation after generation, the people have carried on the tradition introduced to them by a French crew 261 years ago. John Devane, who played the Old Year for the last 20 years, on and off, sadly passed away and will be very much missed. For most of us, he was the Old Year and will remain forever fondly etched in our memories as he emerged from our pub and lead musicians and torch-bearers and all of the local children up and down the village before expiring theatrically at 12:00. Ní fheicimíd a leithéid arís. If you’re from Kerry or are anywhere near the area on New Year’s Eve, this is the place to be. But if you’re looking for a place to stay, you have to be quick, because most accommodation for New Year’s is gone by the end of September.